This is Part 4 of my series on Using the Tools. I have described four more tools in this post that I have found useful in overcoming the temptation to use substances or behaviors that keep me from becoming the person I want to be. 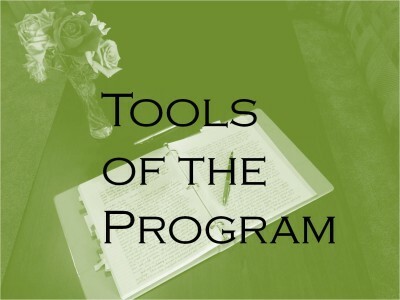 In the previous posts in this series I have written about the following tools: Prayer and Meditation, Meetings, Service, Sponsorship, Telephone Calls, Writing, Music, Program Literature, Scriptures and Talks, a Plan of Abstinence, a Breathing Exercise, and Going to Bed. In this post I will cover Visualization, God Box, Fasting, and the ARP website. You can see all of the posts that have to do with tools by clicking on “Tools” in the list of categories in the right column on this page. As far as I know right now, this completes the list, but since I embrace new tools whenever someone shares them with me, someday there might be a Part 5! If you cannot imagine what your life would look like if you abstained from your bad habits or addictive behaviors, it is hard to make a better choice. Kimberly Schneider taught me to say “Who do I want to be in this moment, and what would she do?” I have found that question to be an incredibly powerful tool. At first I thought of someone I wanted to be like and asked myself the question. It helped me to imagine what that person would do in the same situation and then make that choice. Over time, I learned to visualize what I would be like if I developed the habits and qualities I was striving for and this question helped me to make the choice that would be consistent with the person I was trying to become. When you find yourself worrying or obsessing about something over which you have no control, irritated or annoyed by some large or small quirk or perceived offense, or having to stand by and watch as a loved one struggles with something he or she must master without your assistance, often the most effective thing to do is to make a decision to let go and turn the situation over to God. This may be easier said than done, and making a “God Box” (or “God Can” or “God Bag”) may help. Write the matter down on a piece of paper and, as a physical symbol of the act of “turning it over to God”, put the piece of paper in the “God Box.” Then, if you find yourself worrying about it again, or trying to take back responsibility for solving the problem yourself, you will have to make a decision: either remind yourself that it has been turned over to God and let Him handle it, or take the piece of paper out of the box and tell God that you are going to work on this one yourself. It is amazing how such a simple thing can make such a big difference. It is also an awesome experience to read back over the slips of paper and realize how well God has handled the things that were so worrisome in the past. Just to save you some time, let me assure you that it has been my observation over many years of sharing this tool with others that it does not work if you only do it in your mind. You must physically write the problem down on a piece of paper and put it in a container of some sort. Trust me on this. A very effective way to humble ourselves so that we can receive more of that power is fasting. When we fast we are deliberately putting our physical needs aside and acknowledging our need for and dependence upon God. This helps us to humble ourselves, get in tune with the Lord, and become more willing and able to receive his power. The Church of Jesus Christ of Latter-day Saints has developed a wonderful Addiction Recovery Program website with many features and great content for the support of those who are trying to overcome addictive behavior. It also has a section for family members and loved ones and another section for priesthood leaders. There are videos of people who have found recovery, telling their stories. There is content that discusses the nature of addictive behavior from a gospel perspective. There are podcasts of twelve full LDS 12-Step recovery meetings – one for each of the steps. If you haven’t been to an LDS Addiction Recovery Program meeting, or if you need a meeting and there isn’t one available when and where you need it, listening to one of those podcasts is a great option. I have listed seventeen tools is the four parts of this series. Which ones have you tried? Which ones that you have not tried sound interesting to you? Will you commit to trying them? By when? Which tools work best for you? Write about how using the tools helps you to make better choices when you are stressed and/or tempted. Thank you Mira for these posts on using the tools. I especially like the God box one. Talk about needing an answer to prayers! I needed the reminder about the God box. It is so hard to watch your loved ones suffer and you know for a fact that allowing the Savior to help is their answer. They don’t choose to let Him help. Being codependent I want to find a way to make them listen. From personal experience, I know that doesn’t work and that isn’t the answer. So I prayed for them, wrote the situation down and put it in my God box and turned it over to Heavenly Father. It is amazing how relieved I feel. I do know that God knows the answers and he loves them even more than I. I want His way. I really do feel better! Thank you for the reminder Mira!